Dakota Access Pipeline denies Thompson works for them or any contractor associated with them. 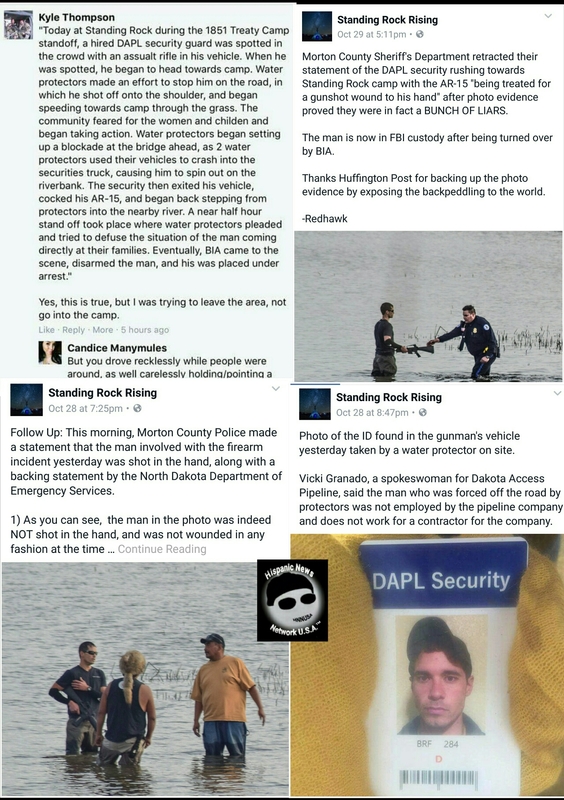 Mandan, N. Dakota – On Saturday, Kyle Thompson, a DAPL security guard that was taken into custody by the Bureau of IndIan Affairs (BIA) near the Oceti Sakowin Camp in N. Dakota went on Facebook (FB) to explain his arrest, but confirmed that he has been released from custody and the FBI is investigating the incident. Thompson in his FB post says, that he was armed to protect DAPL employees and was taking photos of equipment. No camera was found or located in the truck leased by DAPL before it caught on fire. Also, Vikie Granado, the spokesperson for DAPL says that Thompson does not work for DAPL and does not work for a contractor for the company, Standing Rock Uprising reported on FB. Native Americans who confronted Thompson near the Oceti Sakowin Camp found a DAPL security guard ID with Thompson’s photo. Dave Archambault, Chairman of the Standing Rock Sioux Tribe on Saturday said during a press conference, that he believes Thompson had infiltrated a camp and was spying for DAPL. Other water protectors on FB alleged that Thompson who is a Native American (Lakota) himself and an Iraq Veteran named “War Eagle” by his family was hired as an agitator to spark trouble and blame the peaceful water protectors. Members of Thompson’s family attempted to defend his actions on FB, but little success. Thompson removed his FB comments, but FB users made copies and reposted them on the FB comment thread. Harold Frazier, Chairman of the Cheyenne River Sioux Tribe says, an attorney for the tribe will file a request on Monday with Bureau of Indian Affairs (BIA) for information concerning Thompson’s arrest and any pending federal charges related to the incident. If Thompson wasn’t employed by any contractor for DAPL, according to Granado, how did Thompson end up with a DAPL ID. Thompson claims he was working as a security guard for DAPL when he was taken into custody, according to his FB post. DAPL hasn’t confirmed that security contractors are allowed to carry assault rifles at #NoDAPL protest sites. Morton County Sheriff Kyle Kirchmeier in a press conference stated that Thompson had been shot in the hand, but later retracted his information when Facebook photos of Thompson’s arrest by the BIA went viral. Trump invested in the DAPL pipeline construction for profit resulting in the eviction of Native Americans from their land, N. Dakota tribal leaders claim. 300 oil spills in N. Dakota within 2 years from 750 documented by state since 2012, the public was never notified, except for 1 when a oil transport trailer got into an accident with vehicle and spilled oil, the AP reported. It took AP 11 days to get information from both reluctant state officials and oil companies involved. Several tribal leaders claimed that 40 water protectors were injured by rubber bullets and some of the 141 arrested on Thursday were kept on dog kennels and marked in their arms like holocaust prisoners. Mandan, N. Dakota – On Saturday, both Archambault II, Chairman of the Standing Rock Sioux Tribe and Harold Frazier, Chairman of the Cheyenne River Sioux Tribe held a press conference to denounced the untrue allegations made by both Morton County Sheriff Kyle Kirchmeier and N. Dakota State Patrol Bryan Niewind who reported that water protectors were in private property and that a woman was arrested who had a handgun and fired three shots. Archambault said, the disputed land was stolen and sold illegally by the Army Corps of Engineers to the Energy Transfer Partners (ETP), which is affiliated with the Dakota Access Pipeline (DAPL). The land where the DAPL pipeline construction continues to be built and bought by ETP is in question and the oil company is being investigated by the N. Dakota State Attorney General Office, which cited under the N. Dakota’s Corporate Farming Law that it can not buy, lease or own property, if it is not “use for business purposes, registered family farms, ect.” So far, the ETP had until October 27 to file a notice of intent with the state, but it has not explained their intent to use the land other than installing a pipeline that will allow about 500,000 gallons of oil to flow through the land and under the Missouri River. Archambault alleged that EPT is a bad company and currently is being sued in four different legal lawsuits for contaminating the environment. He also alleged that Morton County Sheriff Kyle Kirchmeier is lying (speaks with a forked tongue) when he sent out information to the media that a woman was arrested after she pulled a gun and fired three shots on Thursday at the N. Dakota Highway 1806 during the police assault to evict water protectors from Native American land under the 1851 Treaty of Fort Laramie. Archambault says, EPT hasn’t provided proof that they purchased the disputed land legally. He accused Kirchmeier, multiple state and federal legislators of favoring DAPL oil interests and taking contributions by the oil company. Archambault says, that the pipeline should be moved away from sacred sites that are been threaten or have been destroyed and not allowed to cross the the Missouri River. He suggested that energy pipelines currently crossing the Missouri River should be inspected and kept up to avoid any river contamination. The DAPL pipeline could be rerouted, so it does not cross the river and still allow for DAPL to operate its oil flow through the state, according to Archambault. Frazier confirmed that Kyle Thompson, a DAPL security guard who was armed with an assault rifle had been taken into custody by the Bureau of Indian Affairs officers on Thursday. Archambault alleged that Thompson had infiltrated one of the multiple water protectors camp to spy for DAPL and ETP. Frazier says, an attorney for the tribe will file a public information request to seek more information about Thompson’s arrest near the Oceti Sakowin Camp. Thompson had an AR-15 with 30 live rounds. According to a Facebook video that went viral, Thompson was seen pointing his weapon and firing his weapon at a woman as other water protectors surrounded him after he was chasing a Native American journalist and was discovered to have a loaded weapon. Thompson was headed to the camp. Frazier criticized MCSO deputies for forcing a water protector from a sweat teepee who was praying and arresting him. He explained, it’s like dragging and taking out someone who is praying from a church and arresting him. Sheriff Kirchmeier on Friday confirmed that some of those arrested were marked with numbers on their arms for property identification purposes. Property seized was numbered as the individual arrested, so it could be reclaimed later by the person. Some of the 141 water protectors (protesters) were booked and processed at the Morton County jail, some of those arrested were transferred to four different county jails, at McLean, Cass, Ramsey and Burleigh. Sheriff Kirchmeier said that the Native Americans who block part of Highway 1806 and setup a camp to block DAPL construction were in private property own by EPT, but Archambault disputed that and says the water protectors were in tribal land. Frazier confirmed that he has requested for the U.N. to send troops to the area and monitor the tense situation between water protectors, police and DAPL. Amnesty International is sending observers as well. Law enforcement has block entrance to the disputed land where DAPL continues to construct the pipeline even when an easement permit has been denied until the Corps of Engineers evaluates the environmental impact in the area. U.S. Senator from Vermont, Bernie Sanders has requested for Obama to suspend all DAPL easement permits until an environmental impact evaluation is made along the four state pipeline construction area. President Barack H. Obama has not acted on Sanders request nor Presidential candidate Hillary Clinton (D) has taken a stand on DAPL. Republican presidential candidate Donald Trump has invested interests with DAPL, according to Archambault. 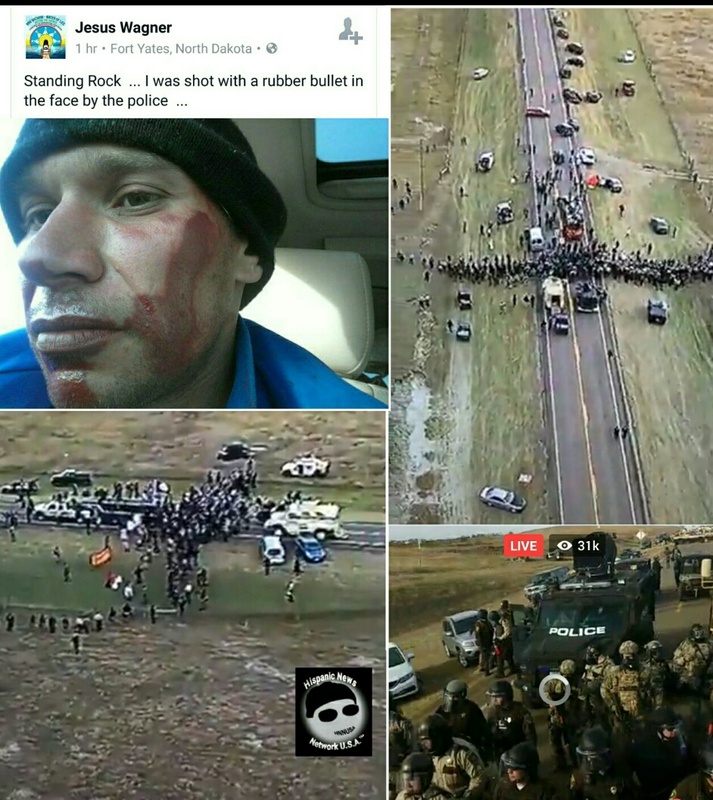 Law enforcement officers from Wisconsin, Indiana, Minnesota, Wyoming and South Dakota including the National Guard assisted the Morton County Sheriff’s Office assault on Thursday, which concussion grenades, mace, tasers, rubber bullets, a LRAD Sound Cannon and a Active Denied System (heat skin irritant) were used to induce pain on water protectors. In other news, the Kahanawake community in Montreal, Canada set up a road blockade on Highway 132 at the Mercier Bridge on Friday for several hours and today in solidarity with the Standing Rock Sioux Tribe. In N. Dakota, Myron Dewey reported Saturday that a 20 vehicle caravan went to collect some teepees and sacred items from the Hwy 1806 camp where 141 water protectors were arrested for trespassing and was not allowed by a MCSO deputy to video record inside the area for Digital Smoke Signals media. Nine people were allowed into the area, according Dewey. Morton County Sheriff deputies and assisting officers launched an assault to clear N. Dakota Highway 1806 and evict Native Americans from a camp along the highway on private property. Cannon Ball, N. Dakota – On Thursday, Morton County Sheriff deputies (MCSO), N. Dakota State Patrol, National Guard and assisting law enforcement officers from seven states launched an assault on Native Americans around 11:00 a.m. to clear a road block and camp on the path of the Dakota Access Pipeline (DAPL). The DAPL pipeline is ready to cross over Hwy 1806 enroute to the nearby river. MCSO deputies fired live rounds of non-lethal ammo (rubber/bean bags) at #NoDAPL protesters (water protectors), one water protector was shot in the face, two teen horse riders were shot at and one horse was injured by a police projectile another horse died from police gunfire. Also, the Active Denial System (heat skin irritant) and LRAD Sound Cannon were allegedly used by military and the MCSO against #NoDAPL protesters to induce pain at Hwy 1806 assault to evict Native Americans from their land. The MCSO reported that 141 protesters were arrested on N. Dakota Highway 1806 and that a woman was being placed under arrest when she pulled a .38 Cal. handgun and fire three shots at officers, no officer was shot. The woman was taken into custody. N.D. State Patrol Captain Bryan Niewind reported that the woman when forced to the ground by officers during arrest, she managed to pulled a gun from her waist and fired three shots. Another incident, Kyle Thompson, a DAPL security armed with an assault rifle chased an unknown person who was operating a drone in the area, but water protectors were able to run his truck off the road. 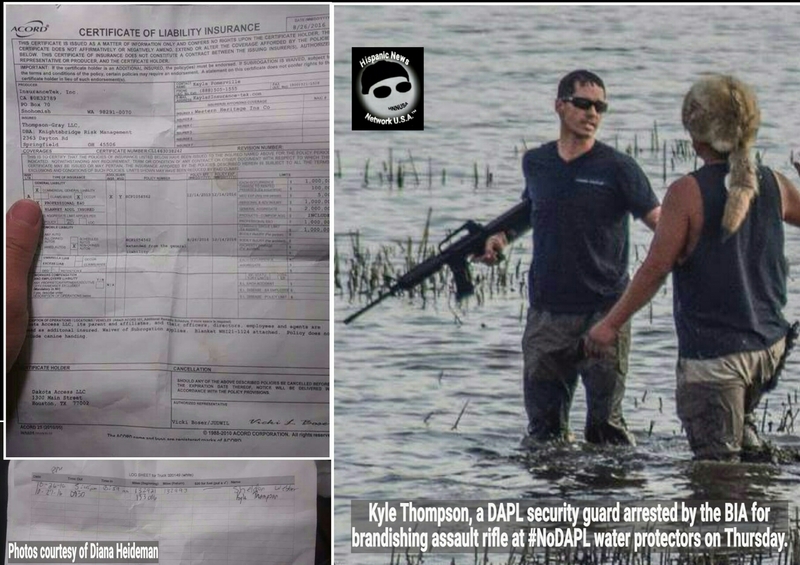 Thompson brandished an assault rifle at water protectors and was taken into custody by Bureau of Indian Affairs (BIA) officers. Thompson is a U.S. Army Veteran who served 15 months in Iraq and in 2007 he was given the name “War Eagle” by his family who are Native Americans. Thompson was caught with an AR-15 near the Oceti Sakowin camp with 30 live rounds, the BIA disarmed Thompson and unloaded the weapon when detained. The truck that Thompson was driving caught fire and was insured for Thompson-Gray, LLC, Knightsbridge Risk Management in Springfield, Ohio. A travel log also indicated that Thompson might have been accompanied by another DAPL security Sheldon Webber who couldn’t be located at the scene and remains at large, according to water protectors who found the documents inside the truck before it burned. Exclusive drone video footage showed Thompson chasing another vehicle and on the horizon, it show DAPL equipment burning, police on foot and vehicles chasing horse riders and shots being fired at them. 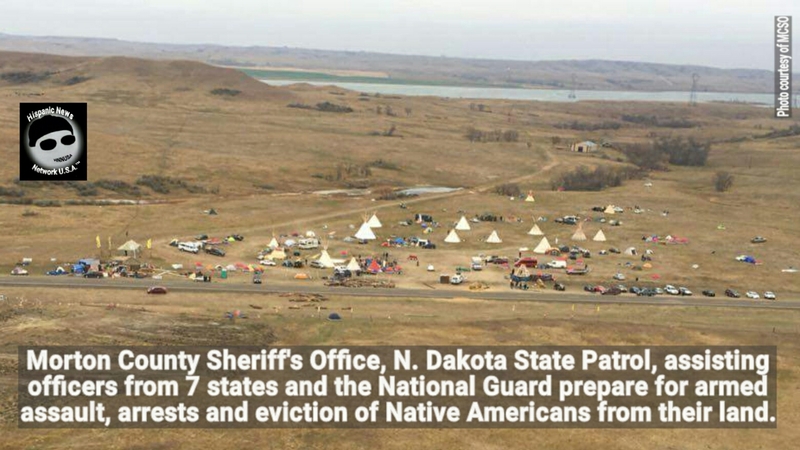 The Morton County Sheriff’s Office, the N. Dakota State Patrol, assisting law enforcement officers from 7 states and the N.D. National Guard prepare for an armed assault to arrest and evict Native Americans from their own land. Mandan, N. Dakota – N. Dakota Morton County Sheriff Kyle Kirchmeier confirmed, it costs $500K per day, County has spent $3M to date and state nearly $6M involving #NoDAPL protests. The $5.8M earmarked funding for providing law enforcement services during the DAPL protests has nearly ran out, according to the N. Dakota Department of Emergency Services. The funding was a loan approved by the state’s Emergency Commission and must be repaid to the state-owned Bank of N. Dakota with interest. What does it mean, Wisconsin, Minnesota, Indiana, S. Dakota, Nebraska and Wyoming will most likely not get full reimbursement for sending law enforcement officers to assist the MCSO during #NoDAPL protests once the funding runs out. Sheriff Kirchmeier, N. Dakota Highway Patrol, assisting law enforcement officers from 7 states and the N.D. National Guard getting prepared for an armed asault to arrest and evict Native Americans and allies from disputed Indian land from the 1851 Treaty of Fort Laramie. Under Indigenous Eminent Domain, Native Americans have reclaimed their land including a section of Hwy 1806. Cass County Sheriff Paul Laney, the Chief of Operations for the Morton County Sheriff’s Office wants the Native Americans to go back to the their reservation, but Laney is in Indian land and is considered the invader by #NoDAPL water protectors. Will President Obama and the U.S. Department of Justice, the U.S. Army Corp.of Engineers and the U.S. Department of the Interior avoid bloodshed in N. Dakota or will it become a repeat of Custer’s last stand? The Morton County Sheriff’s Office (MCSO), the Dakota Access Pipeline (DAPL) and N. Dakota state officials are facing criticism and unpopular sentiment by many Americans for their alleged blatant violations of Native Americans (water protectors) and allies civil rights to peacefully protest. Native Americans have video documented many of the alleged violations and illegal acts by Morton County authorities, DAPL private security and assisting law enforcement officers. 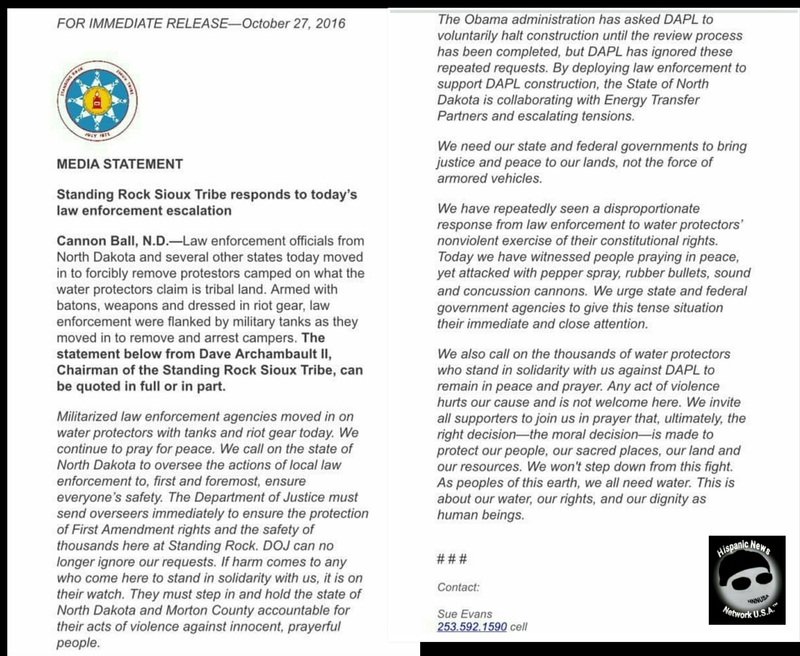 Sazue Sr., the tribal chairman for the Crow Creek Sioux Tribe cuts ties with the S. Dakota government after refusing to call back members of the S. Dakota State Highway Patrol assisting the Morton County Sheriff’s Office at #NoDAPL protest sites. 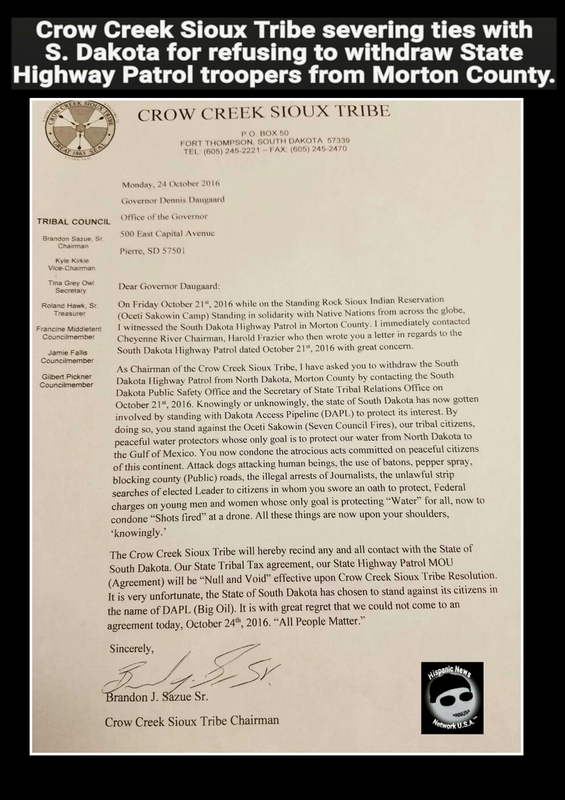 Fort Thompson, S. Dakota – On Monday, Brandon J. Sazue Sr., the Chairman of the Crow Creek Sioux Tribe (CCST) sent a letter to S. Dakota Governor Dennis Daugaard (R) informing him that once the tribal council approves a resolution, the tribe will cut all ties with the state government for their refusal to “withdraw” S. Dakota State Highway Patrol troopers assisting the Morton County Sheriff’s Office (MCSO) at Dakota Access Pipeline (DAPL) protests sites. Sazue Sr. himself witness a S. Dakota trooper vehicle in Morton County while visiting the Standing Rock Sioux Tribe. So far, Governor Daugaard has not released a statement about allowing or the withdrawal of state highway patrol troopers assisting the State of N. Dakota and the MCSO in protecting their DAPL oil interests. Sazue Sr. in a press release confirm, that the CCST will “rescind any or all contact with the State of South Dakota” including the “Null and Void” of the State Tribal Tax agreement and the State Highway Patrol (MOU). MCSO and assisting officers from WI, MN, IN, SD, NE and WY have been committing illegal stops and seizures without warrants, instigating attacks on peaceful Native Americans and allies during prayer ceremonies at #NoDAPL sites and shooting at Native American media drones to cover up illegal acts, macing water protectors (protesters) without provocation, arresting with abusive intent and charging journalists with criminal trespassing and rioting, including the abuse of criminal law concerning a riot and charging peaceful water protectors with engaging and inciting a riot when multiple social media live streaming videos at DAPL sites indicate that the MCSO deputies and assisting police are the ones engaging in a riot themselves. MCSO deputies and assisting officers including Morton County Sheriff Kyle Kirchmeier, Cass County Sheriff Paul Laney and Morton County State Attorney Ladd Erickson have shown a pattern of prosecuting journalists for reporting non-favorable news and blatant discrimination practices against Native Americans by charging protesters with frivolous rioting. Many Native Americans charged with a minor violation have been also stripped search while being booked at the Morton County jail to humiliate them and break their spirits, but have remained defiant against their cruel treatment. To date: not one of the White DAPL private security guards who unleashed a vicious dog attack against Native Americans and allies on September 3rd have been brought to justice. Those MCSO deputies and assisting rouge law enforcement officers (Outlaws with a badge) who intentionally violate the civil rights of Native Americans and allies could face federal lawsuits under the law. The states from where those officers come from could also be liable as well. Update: Facing criminal charges, 7 Ohio Frost Kennels dog handlers involved on the September 3rd vicious dog attack of #NoDAPL protesters had no valid N. Dakota work license to do so, according to the Morton County Sheriff’s Office ongoing investigation. It is a Class B misdemeanor for a private security company to work without a valid license in the state. No charges have been filed yet and the investigation of the incident is under review by the Morton County State Attorney’s Office. Democracy Now video recorded the dog attack. Randhawa and another suspect fled on foot after a fatal hit-and-run crash in downtown Milwaukee. 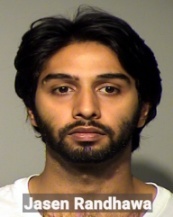 Milwaukee, WI – On Monday, Jasen Randhawa, 23, of Mequon turned himself to police in connection with early Sunday’s hit-and-run crash that resulted in the deaths of three women, Lindsey B. Cohen, 35, Ashley L. Sawatzke, 30 and Amy C. Taylor, 32, all from Chicago. The three women were riding in a Uber without wearing seat belts and the Uber driver Timothy Snyder, 41, who survived the crash was driving westbound on W. Clybourn St. when Randhawa with another passenger in a 2015 Lexus R350 ran a stop light going southbound on S. 2nd Street and struck the Uber. Both Randhawa, the Lexus driver and his passenger fled the scene on foot. Snyder suffered a broken vertebrae and bleeding near the liver. Randhawa is facing three felony counts for vehicular homicide while intoxicated and felony hit-and-run including additional charges. In October 8, 2015, Randhawa pleaded guilty in Ozaukee County to misdemeanor driving with a revoked license for refusing to take a blood test for alcohol or control substances and paid a fine. One person was arrested at the entrance of a DAPL boring operation in Montrose, Iowa where toxic chemical sludge is being dumped on ground water. 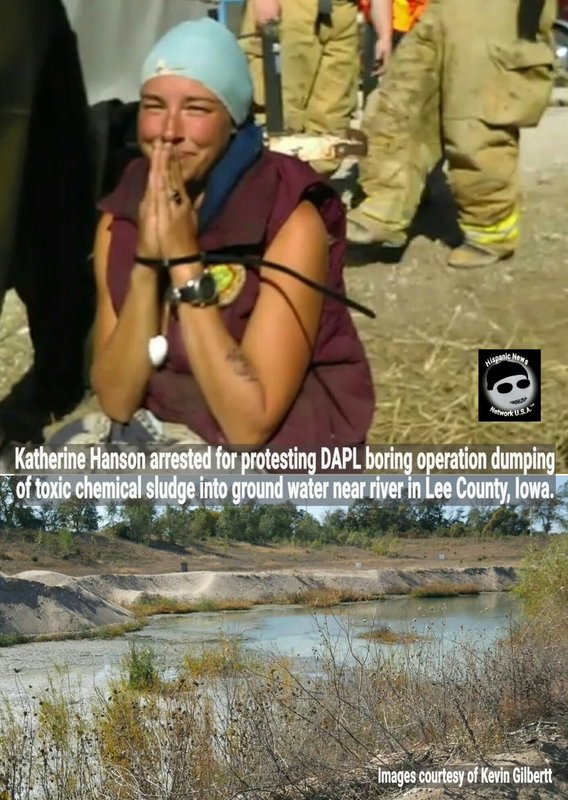 Montrose, Iowa – On Monday, Katherine Hanson was taken into custody by the Lee County Sheriff deputies in Montrose after blocking the entrance of a Dakota Access Pipeline (DAPL) toxic chemical sludge dumping into ground water. The water protectors (protesters) are from a group called Mississippi Stand and are struggling to stop the DAPL construction along with the N. Dakota Native Americans in Morton County. The Lee County authorities allowed for the Mississippi Stand to continue to block the entrance since it is located in public property. One man had locked himself under a trailer as well. At another #NoDAPL protest site, on Monday, N. Dakota State Patrol Captain Bryan Niewind confirmed, Hwy 1806 to Bismarck where pipeline will cross is open, but controlled by #NoDAPL protesters under Indigenous Eminent Domain. People are being adviced to seek other alternative routes. Capt. Niewind reported that the N. Dakota Highway Patrol and the N. Dakota Department of Transportation have closed Highway 1806 from the Sacred Stone Camp at Fort Rice Road indefinitely and an additional detour from the intersection of Hwy 1806 and 138A, on the Northside of Hwy 1806 at the junction of Highway 24. Morton County Sheriff Kyle Kirchmeier also confirmed, that law enforcement officers from MN, S.D., IN, WI, WY & NE are/will assist at #NoDAPL protest sites. The Morton County Sheriff’s Office (MCSO) reported that 126 #NoDAPL protesters were arrested on Saturday and one on Sunday and since August 10, a total of 269 protesters have been arrested and charged with various crimes including misdemeanor criminal trespassing, disorderly conduct, assaulting an officer, spitting at an officer, stalking DAPL security, engaging in a riot and in addition, felony counts for rioting and endangerment for locking themselves to DAPL equipment.